I really try to just focus on one room at a time so that I can actually get one project finished (ummm, like my master bath) before moving on to the next, but I couldn't resist trying to nail down an idea for my master bedroom. 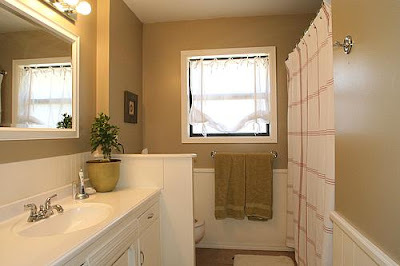 Really, since the rooms need to be friends with one another don't you think it would make sense to have some idea of what my bedroom will look like before I finish the bathroom? That could just be my own convoluded justification speaking...but I'm going with it. So, here's the story. I stumbled upon the coolest website. It's called sproost.com and it actually has one of the better "What's your style" quizes I've seen. It nailed my style right on the head "58% Nantucket Style, 42% Cottage Chic"...yep, I think that's about right. And then they have this awesome feature where you can sort of create your own room by picking furniture and accessories that appeal to you (and you can buy them if you want, but that's not how I shop....$1600 for an armoire? I don't think so). 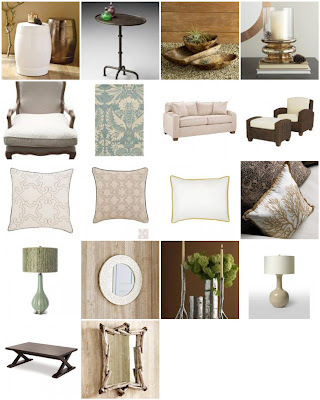 Here are a bunch of items I picked for my fictional room. It was somewhat enlightening for me to see that I'm drawn to both classic pieces as well as rustic/natural pieces. Apparently, I need that balance. I blame it on being a Gemini. 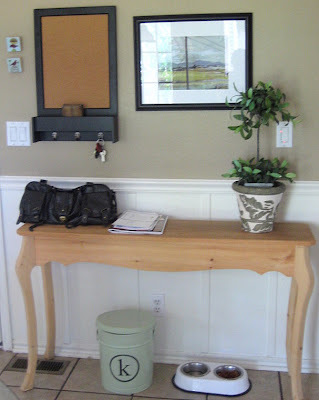 As usual I'll try to replicate items through flea-tique stores, TJ Maxx, Marshalls, Craigslist, and shopping the house so I can create a room I love at a fraction of the cost. We'll see how well it comes together (after I finish my master bathroom! ), but it's nice to have a starting point. I fell in love with our suburban cottage the first time I saw the MLS listing online. Seriously, I would have bought it before ever setting foot inside of it; I just knew it was the place for us. I was going through a horrible divorce and I desperately wanted a house where I could create a home for my son and I. 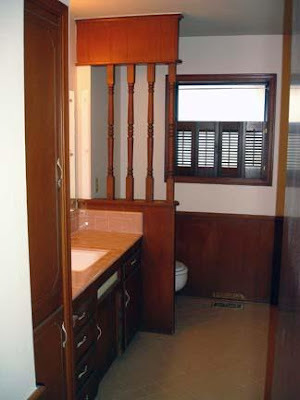 Sure, the house had outdated wallpaper, brass fixtures galore and ugggly laminate countertops, but I was able to see past all of that. I knew I could make it our own, even on a super tight, single mom budget. I don't believe that beauty has to cost a lot of money - beauty just requires a good eye, lots of creativity, and a whole lot of elbow grease. So far in our new home, I've eradicated the place of 1980's wallpaper, updated paint, and switched out light fixtures...all by my sassy little self. 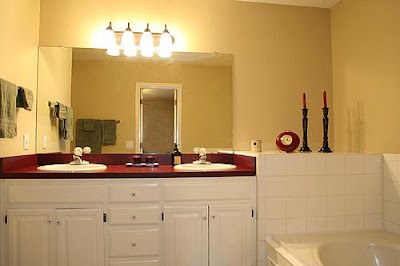 And those ugly laminate bathroom countertops? I couldn't afford new ones (not even cheap laminate), but being greeted each morning by burgundy laminate just was NOT an option. So...I painted them. 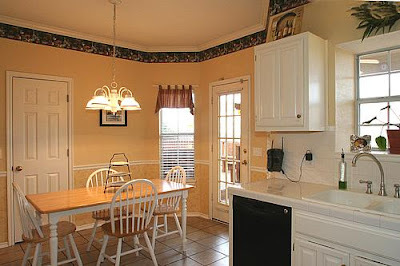 Yes, I painted my countertops. Don't worry, the process I used is plenty durable and I'm loving the results. The point of this little story? I believe everyone deserves a beautiful home regardless of their financial situation. With a little creativity and elbow grease anyone can create beautiful surroundings that make them happy and feel like they're HOME. Have you heard? Barking Mad has gone....well, barking mad! She's giving away one $250 Target gift card. That's groceries, clothes, bedding, weed killer...you get the idea. Click here for more details. Even though I never win anything (except for that time when I was 13 and won New Order concert tickets over the radio...and my friend and I were too young to go alone so my dear sweet dad had to take us....and then he made us leave early because the crowd was "wierd", which to his credit it probably was) I'm still going to throw my hat in the ring. To enter you need to list 5-10 of your favorite posts. Regardless of whether or not I win, I thought this would be a good opportunity to share my home creating philosophy with you. I'm so sorry that many of you may have already seen these posts. I believe that with enough elbow grease and creativity anyone can have a home they love without breaking the bank. Thanks for your patience today. Have a good one! 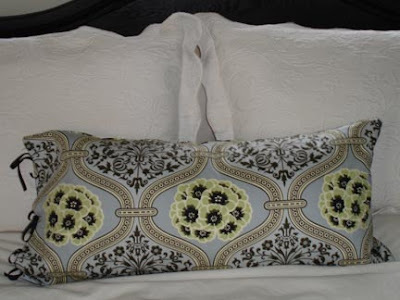 I did have this pillow on my bed in my old house for a while and I loved it (and made it myself...oh yeah, I was all full of myself for actually making a pillow that looked pretty). It was just muted enough to work with my decor. 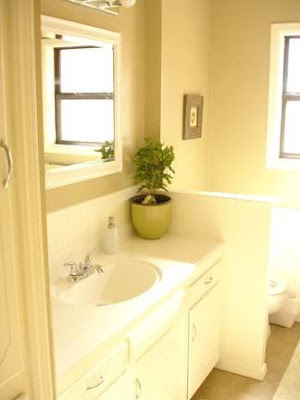 I saw this BHG bathroom on a post at The Inspired Room yesterday and I swooned. Ahhhh, I love the mix of classic and modern. Again, I wish I could live in a house that cool. I discovered this great duvet last week on Mommy and Beyond. I never would have thought of making a duvet out of Amy Butler fabric. Genius! Okay, I could live with this in my house...definitely. Isn't it beautiful? I was blown away the first time I saw this rocking chair makeover from Creative Little Daisy. She transformed a run of the mill rocking chair into something utterly unique. Bravo! Thanks for being such a rock star Amy (uh huh, we're totally on a first name basis...LOL). Okay, I was being a little overly optimistic about finishing my bathroom over the weekend. Right now it's a little like a half baked cake...you really don't want to see it yet because it's all runny and gooey, or something like that. I promise I'll have some great stuff to show you soon. So, in the meantime, I thought I'd chat about a fun little container I made for the kitchen. I hated the big ugly yellow dog food bag and I really wanted something like these from Ballard Designs, but without the $49 price tag. I looked high and low and found this canister online at The Honest Kitchen. It was the perfect size and only $18...very doable. I gave it a little shot of this spray paint. 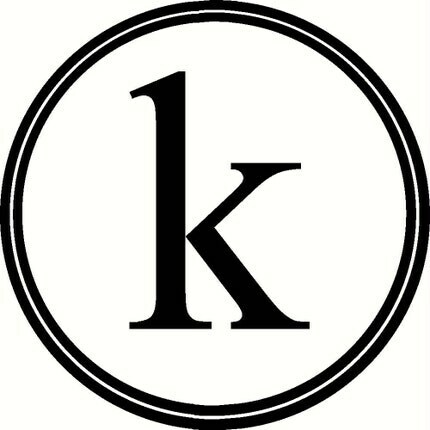 And then added a "K" for Kingsley (my little pooch's name) that was custom made for me by Vinyl Vineyard on Etsy. And voila! A pretty dog food container for a pretty little price! Thanks for everyone that stopped by yesterday. Some of you had a few questions that I thought I'd take a second to answer. 1. WHAT'S THE PAINT COLOR? 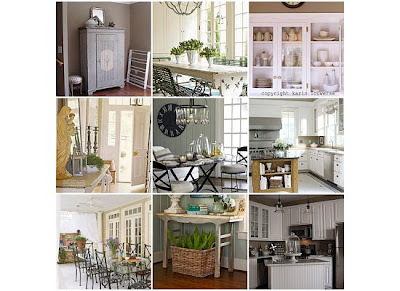 The wall color in the kitchen is Restoration Hardware Cappuccino. I LOVE this color. In fact I'm actually using it in my master bathroom that's in the works. It's a warm, gray, beige with slightly green undertones...um, got all that? It's also dark enough to give some contrast, but not so dark that the room feels like a cave. It's $32 a gallon at Restoration Hardware, but you can pick up their sample cards free and have it color matched at Home Depot or Lowes. P.S. For those who have asked, I found the table on Craigslist for $35! I've seen many other similar tables on there since, so definitely check it out. I bought the chairs last spring at JC Penney Home. They were intended to be outdoor bistro chairs, but I used them inside (duh...obviously). They were a little splurge in my mind at $15 each ($60 total). I hate to spend $60 at a time for anything, but I love them so much I can't regret the purchase. I feel you. 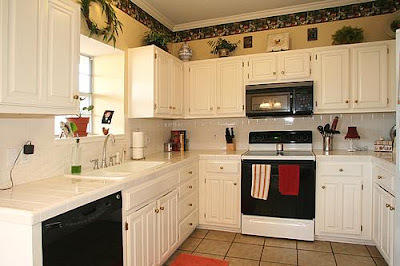 I love white cabinets too. In fact I love them so much that I painted the 80's oak cabinets in my old house. Here's a link to a tutorial I did recently. Here's a link that talks about my "secret". I found most of the accesories for the kitchen at a flea-tique store. I love Target as much as the next girl, but I'm telling you it's worth it to get out of the "box" (get it...like, "big box"...ok, I'm cracking myself up here, sorry) every once in a while and check out places like flea markets, thrift stores, antique stores, yard sales, estate sales, etc. You'll not only get unique pieces, but you'll usually spend A LOT less. 4. WHAT'S THE STORY WITH YOUR WINDOW TREATMENTS? I edited this post to add this one. 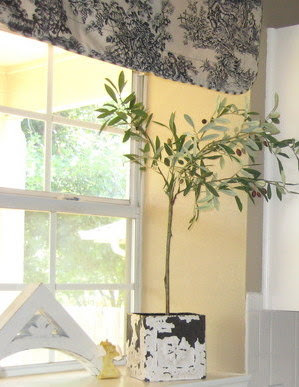 I told the story of the toile valance in yesterday's post, but in case you missed it it's a euro sham I just draped over a rod....rocket science I know :). As far as the curtains go (brace yourself for a super complicated fancy explanation) I bought 1/2 a yard of ticking stripe fabric (I think it was about $8) and in true Nester style I clipped it over white Ikea curtains I already owned. That's it. Although, I think the Nester might have at least bothered to glue gun something to make it a tad more finished...but I just left it as is. I might hem the edges with iron on tape at some point but haven't done it yet. Again, I think Mensa or Martha Stewart will be calling soon :). I hope everyone has a great weekend! I'm hoping to get enough done this weekend to give you a peak at my master bath update on Monday. Let's keep our fingers crossed :). The Nester has been doing a great series over the past few weeks called "Ten Minutes to a Room You'll Love". That woman is such an inspiration. I want to invite her over for tea, have her wander through my house sharing her magical suggestions for each room, and then sit for a spell on the porch and share hair care secrets (have you noticed how great her hair is?). Well, I don't think we'll be discussing hair secrets over tea any time soon, but her series does provide some magical suggestions for the main rooms in your home. I chose to use her suggestions to focus on the kitchen...at least for now - I still have big plans for the master bath and bedroom. You can click on the button below for more info on The Nester's magical secrets....to decorating (I thought I should add that last part). The kitchen is my favorite room in our house. I updated it last summer and I love how it turned out....and when I say "updated" I mean paint, a new light fixture and new cabinet knobs...I'm not talking anything fancy here. The Nester inspired me to (well...clean up a bit, and) analyze what I like so much about this room. These are the elements I came up with that have made a big difference in my kitchen. I'm talking about colors you're drawn to over and over again, colors that you find soothing or energizing (whichever you feel you need in there), colors that compliment each other. 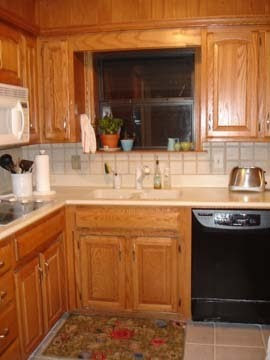 This is what the kitchen looked looked like before, with the previous owner's stuff...not terrible by any means, but not me at all. Instead really wanted soothing, muted, light colors that felt more like me. After a few small changes I got the room I wanted. If you can't paint your walls, don't stress. 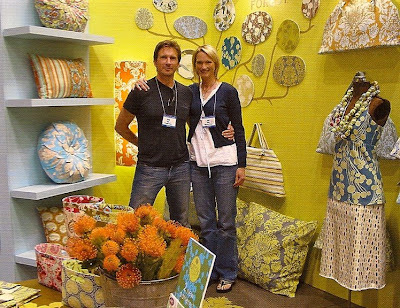 Use fabrics, dish towels, plates, and other accessories to bring color into the room. Again, I said "love". I love ticking stripe. It has such a simple but slightly european feel to it. I dig that - It just makes me happy...go figure. I also fell in love with this toile. Believe it or not it's a euro sham I found at my favorite flea-tique store. I bought it for a steal (I think $5) and draped it over a rod. So, yes, I essentially have a glorified pillow case hanging over my window...but I love it so much I lose no sleep over it. Also only use dish towels you love. 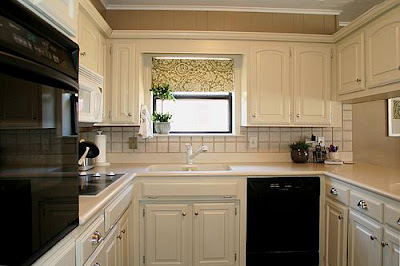 Why keep using that tattered old dish towel with the rooster pattern you loved in 1992. You can buy a package a beautiful new dish towels at TJ Maxx for $5! I wish I could A) afford real topiaries and fresh hydrangeas, and B) keep them alive. Since I am totally incapable of either of these things I go faux. However, I only use stuff that looks like it could be real. I think this one applies to almost every room in the house. I bought this art print at an arts festival in Park City, Utah when I was "home" last summer. It's a painting of nothern Utah and it reminds me of home every time I look at it. This is a photo of my son and I at a football game that I had printed in black/white and just tacked on a cork board. This reminds me of the time I took my son to Disneyland when he was 5 years old. It was our first trip alone together and it was a big deal to me to save up and pay for it myself. And I know we're not supposed to have stuff junking up the outside of the fridge, but living so far away from family I really like having a few photos and cards on the fridge of friends and family members. That's just how I roll. Seriously, why skimp on the pretty? I keep dish soap in a cute glass soda bottle. I contain clutter with a nice little basket. Coffee and Splenda go in pretty containers on a fun vintage pedestal (which also holds my aerolatte...if you don't have one you're totally missing out!). I didn't think I had room in the kitchen for a side table, but I really wanted something to place the mail on when I came in the house. I found this beauty at my favorite flea-tique store (are you seeing why it's my favorite yet?) for $35! If you really don't have room for a side table, try a ledge or shelf you can just hang on the wall. 7) YOU MUST HAVE MUSIC! I have to have music in my kitchen. It's so much more fun to cook when you're dancing along with Justin Timberlake. Oh, and just for the sake of keeping it real, this is what my kitchen table looked like the other day. Thank you Nester for the kick in the pants to get things under control again :).